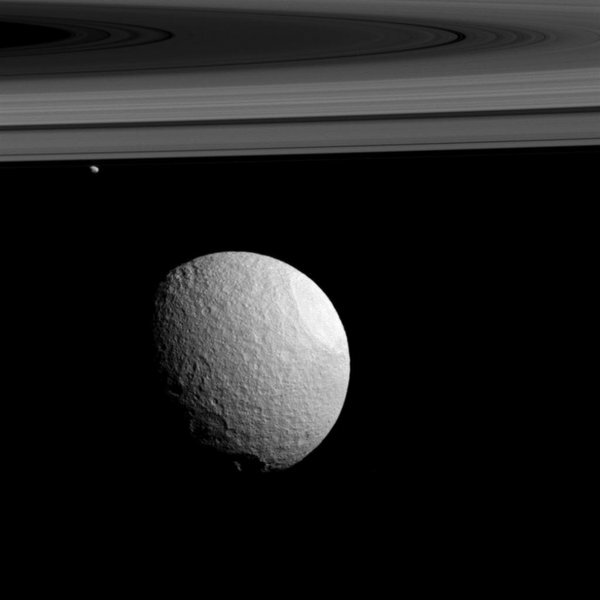 Saturn’s moons Tethys (in the foreground) & Janus (small irregular moon in the background) – Courtesy Cassini spacecraft – nasa.govThe view was obtained at a distance of approximately 593,000 miles (955,000 kilometres) from Janus. Image scale at Janus is 3.7 miles (6 kilometres) per pixel. Tethys was at a distance of 810,000 miles (1.3 million kilometres) for an image scale of 5 miles (8 kilometres) per pixel. Janus is a small inner moon of Saturn (radius 90 km and density, 0.63 g/cm3 and orbit 151,470 km) and has a nearly identical orbit to the moon, Epimetheus (not seen in this image). The moons are separated from one another by an astonishingly small 50km. Every four years they swap orbital positions. Janus is heavily cratered with the largest having a radius of 30km. The passage of Janus through the rings of Saturn maintains the sharp edge of the A ring. Tethys is a mid-sized moon of Saturn (radius 530 km, mean density 0.98 g/cm3, surface gravity 0.15m/s2 and orbit of 294,600 km). Tethys has the lowest density of any of the major moons of Saturn and consists of water ice with just a small fraction of rock. The surface of Tethys is very bright, being the second-brightest of the moons of Saturn after Enceladus, and neutral in color. Tethys is heavily cratered and cut by a number of large faults and grabens. The largest impact crater, Odysseus, is about 400 km in diameter and the largest graben, Ithaca Chasma, is about 100 km wide and more than 2000 km long. Moons like Tethys are large enough that their own gravity is sufficient to overcome the material strength of the substances they are made of (mostly ice in the case of Tethys) and mould them into spherical shapes. But small moons like Janus are not massive enough for their gravity to form them into a sphere.